Special Plan for Public Transport System on long and short distance, buses will follow a UTS unidirectional traffic system with four doors for men, women and families will have separate doors for getting in and out, almost first time in the world. Economical and safer bus rapid transit. School bus, taxi, vans and three wheelers. Railway System – Long/Short distance trains, metros, monorails, goods trains. Goods Carriers - LCVs to heavy duty long trailers. Village / City Bus service. Inter-city and Inter-state bus transport. Private transport such as auto Rickshaw, small/big taxi and rural (Share) taxi. This system needs to be streamlined and strengthened completely. There will be written / oral / practical tests including ‘New road and transport planning of entire India’. Any physically fit citizen of India can apply for a license and the eligibility of age will be 16. Hence these lessons may be introduced in schools and colleges as well. The driving tests will need to be passed by applicants even for renewal of licenses. 2 Lack of standardization give variety in BRT. Existing wide roads can be converted immediately (with minor changes) into BRT roads with just introducing continuous divider along with BRT lane. e. g. existing 18.29m wide one way or 36.58m wide two way can be converted since it already has a separate bus lane. 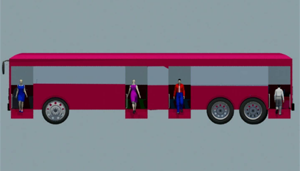 3 Needs new types of buses with right side doors, resulting new investment. Existing buses can use. New investment is not required. 4 These new types of buses with right side doors require left side doors as well to run on existing routes apart from BRT, resulting in wastage of space in the buses. New types of left side four door buses can be used for BRT as well as for the existing routes in addition to existing buses resulting in saving of space in all the buses. 5 India has a right hand drive & left side traffic system, hence existing bus / bus stops / stands cannot be used. Need to install all new-bus stops/stands/dividers. Existing bus stops / stands can be used. Needs additional bus stops only on those routes where two way BRT is required on one way road.